Picture this: you’re out to grab a few groceries - you pick up your milk, bread, veggies and a sneaky chocolate bar - and head over to the counter. How are you going to pay? If you’re like a lot of Aussies, you don’t really carry a stack of cash anymore. And you don’t want to pile your weekly shopping cost on top of your credit card balance - after all, you’ve been doing so well in paying it off. That’s where a debit card comes in. Ready to start looking at cards? Check out below. A debit card is a great way to spend your own money - it’s got all the convenience of plastic, but without the credit card trap of piling up a bunch of debt. It also means you don’t have to carry around a wad of cash, which can not only be annoying, but also unsafe. Your debit card is basically a convenient way to access the money you’ve got sitting in your transaction account, without having to go and line up at a bank. Through the retailer's terminal. This is your basic swipe/insert purchase, and usually, you’ll have to enter your PIN. Using contactless payment methods. More popular than ever, contactless payment methods include PayPass and Paywave, as well as newer technology like Apple Pay and Android Pay. By entering the card details. Mostly useful for online shopping, you can also choose to enter the card number, expiry date and security code on your debit card to make a payment. Hitting up the ATM. If you like the tangible feel of cash in your hands (it can be a great strategy for sticking to a weekly budget!) then a debit card is still super useful. Instead of having to withdraw in a bank branch, you can use your debit card to withdraw cash from an ATM. If you’re looking for a debit card to take on your next international trip, then you need one that comes with a low foreign exchange fee, overseas purchase fee and foreign ATM fee. The best thing about carrying a debit card on your overseas holiday is that it will help you budget - that last souvenir or poolside cocktail won’t send you into debt, because you don’t have the option to spend money you don’t have. Although debit cards won’t nab you the same freebies as a well chosen rewards credit card, there are some options that come with extra perks like cash back on tap and go purchases, and rewards like special offers on event tickets and home entertainment products. Some debit cards now even come with points schemes attached, so you can earn rewards points on your account balance. Have you heard about digital wallets? They’re the next big thing in easy payment options, and let you pay with your electronic device (usually a smartphone or computer) while hiding your personal financial information. Some of them, like Visa Checkout or MasterCard MasterPass are designed for online use, while others, like Apply Pay or the CommBank app will let you pay with your smartphone in store. Not all debit cards offer a digital wallet option - so check with your bank if this is something you’re interested in. 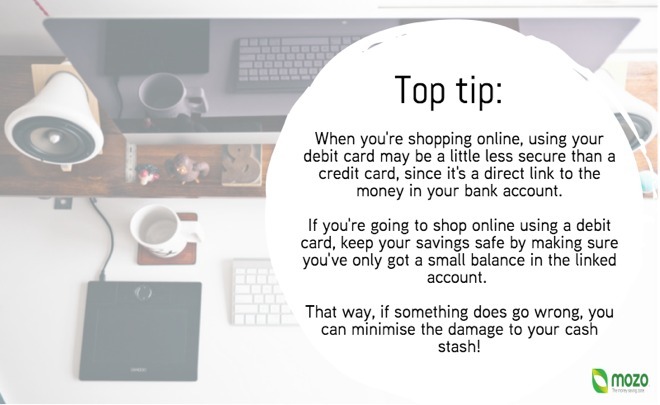 Debit cards are a great option for students trying to stick to a budget and minimise debt, since you can only spend what you’ve already got. And the best news? The big banks (and some of the smaller ones) often offer a student debit card option that comes with no monthly bank account fees. Technically, Visa and Mastercard aren’t types of debit card, but rather payment methods. But, depending on who you bank with, you’ll likely wind up with one or the other when you opt for a debit card. So what’s the difference? As far as debit cards go, not a great deal. Usually, you’ll just wind up with whichever one your bank has a contract with - and if you would really rather one over the other, you might need to swap banks to get it. These days, a debit card is a pretty standard inclusion in any budget savvy wallet. Whether you prefer to use cash or plastic at the checkout, a debit card is an easy way to get your hands on either. And if you’re just starting out and have never used plastic before, a debit card is a great low risk way to start. It’s especially a good idea for people who don’t trust themselves to use a credit card - if you tend to rack up huge credit card balances and not pay them off before the end of the month, a debit card might be a good alternative. You use it much the same as a credit card, but it only gives you access to money you already have saved, so there’s no chance of going into debt. Want to read more about the difference between a credit and debit card? Check out our debit cards vs credit cards guide. Convenient - you don’t have to carry cash, or worry about making credit card payments later. Many debit cards have a daily withdrawal limit, so if you’re making a big purchase, or shopping up a storm, you may not be able to use your debit card for all of it. You can only spend the money you have - and not borrowing the money means there’s no risk of having to cough up interest on an outstanding balance. You can only spend the money you have - which means that, unlike a credit card, you can’t use a debit card to buy something now and pay for it later when your pay cheque comes through. Grab cash at an ATM or even in some stores without paying a cash advance fee, which often come with credit cards Debit cards can be less secure when shopping online, because they’re a direct link to your money. Most cards can be set up to prevent overdrafts, which means there’s no chance of spending money you don’t have and being hit with extra fees. If you’re a fiend for credit card perks, you’ll be disappointed that your debit card doesn’t often give you a chance to earn rewards. There’s no risk of damaging your credit rating by carrying a debt on a debit card. But, on the other hand... Using a debit card won’t help you build a good credit score, like responsibly using a credit card will. A debit card is easier to get than a credit card - your bank will usually offer you one to go along with your savings or bank account, no rigorous application needed. Some hotels or venues won’t accept a debit card for a security deposit - you may need to carry a credit card for this purpose. Read next: Debit card fees and features.